The End of Michael Carrick? 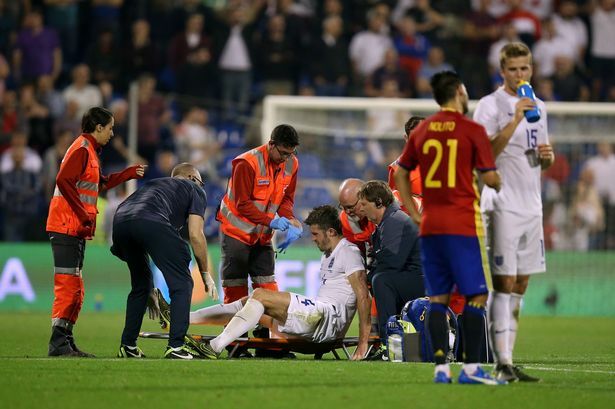 During the final moments of the England vs. Spain International match-up Michael Carrick went down with what appeared to be a severe ankle sprain and needed to be carried off the field by physios with a stretcher. While no official word has been given yet most expect to know the full extent of the injury report during Louis Van Gaal’s pre-Watford press conference. It’s suspected that Carrick has severely injured ligaments in his ankle. While it isn’t good news for England, who are still scheduled to compete against France tomorrow despite the recent terror attacks, and are now down over 16 men from their roster, it especially isn’t good news for Carrick who has had injury trouble before. The midfielder suffered a similar ankle injury during his first summer training session with Van Gaal and was out for 10-12 weeks. He made his first appearance back at full speed on November eighth. The reds will call up Jesse Lingard to fill Carrick’s place for the International friendly. The question that is left is how long will Carrick be able to continue in the EPL? At 34 he most recently signed a contract in March to stay on with United for another year. But with another ankle injury so close to the upcoming March? It’s hard to imagine that United is eager to pen another year despite his nearly 10 year history with the club.